During my latest visit in Sephora couple of days ago I came upon the new X-Rated mascara form Smashbox. I felt tempted by this top-end product form the world famous brand. I bought it not only for my lashes, which need natural and effective curl, but also to make review specially for ladies interested in this product. Smashbox Cosmetics handed us few cosmetic novelties. Their beginnings reach certain photographic studio in Los Angeles, where emerged the need of immediate effect, perfectly co-operating with the lashes and most of all long lasting mascara. Changes in look are common during photo shoots, and each of them is associated with cumbersome make-up removal and mess in the eye area. To meet those issues were created X-Rated mascara collection, Indencent Exposure and fitting all the needs Photo Finish Lash Primer. I bought first position. Smashbox X-Rated Mascara is a luxurious product with very interesting appearance. Inside of “twisted” vial is hidden innovative brush Triple Threat Brush, which is built of three rows of bristle. I have never came upon such a system of placing bristle on the mascara brush. First impression is really promising. Mascara’s formula is supposed to give covered with pigment lashes, natural curl and hyper-thick lashes with velvety smoother. Sounds fabulous, but what is the reality? Triple Threat Brush is an extremely easy brush. Lashes are co-operating with it very well and drown in the brush’s bristle, giving great definition and lashes covered with pigment from every angle. I really hate when lashes are covered only at the base and you have to use applicator again on the top. Smashbox X-Rated Mascara eliminates this problem. Thickening and smoother effect is noticeable after first use. Manufacturer promises that this mascara can be used with no limitations; you can add another layers as you like. I was sceptical, because the most common mistake in using mascara is application of too many layers. I tested it specially for this review. 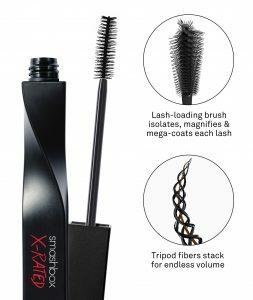 X-Rated Mascara form Smashbox really allows application of few layers without gluing lashes together, lumps or cracks. Despite of that, I recommend application of up to four layers not more of Smashbox X-Rated, because later lashes get fake and over the top effect.